Our patented one-sided steering braces are the only steering brace worth buying for your Dodge Ram. 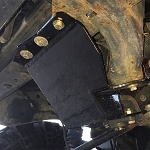 These braces will secure your steering box without allowing frame flex to twist on the bearing. Not only is our design superior to all other braces on the market, but we use the strongest materials and have the only stainless steel adapters on the market. If you want the best steering brace available for your Ram truck, you've come to the right place. Select your generation below for more information.